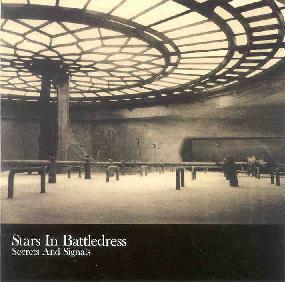 Stars In Battledress - "Secrets And Signals"
The curiously named Stars in Battledress is the UK duo of brothers Richard and James Larcombe. On their debut CD they weave a sometimes rich, sometimes sparse tapestry of progressive chamber pop with ambient, psychedelic, and theatrical influences. While the music is mainly piano and guitar based, the brothers do incorporate some other instruments into the mix as well, including autoharp, harmonium, organ, hurdy gurdy, and hammered dulcimer. Producer Tim Smith also adds some lovely string arrangements on a few of the pieces. Sometimes the music has a lush, dreamy, fantasy quality about it, as on the opening instrumental I Spook the Language; Polished Floors, with its deep string arrangements; and Pinocchio Falls in Love, with its complex musical structure. Other pieces are sparser, some with just piano and voice, like Oh Engineer and Thumps, Kicks and Shoves. These ones evoked the sense of theatrical or stage music most often, especially due to Richard Larcombe’s dramatic vocal delivery. While it’s all not exactly my thing, I can say that the Larcombe’s are certainly talented and creative songwriters. I did enjoy some of the more lushly arranged pieces for their wistful, psychedelic feel, but I’m sure overall this would appeal more to fans of groups such as Belle and Sebastian, and those who enjoy a theatrical flair to their music. For more information you can visit the Stars In Battledress web site at: http://www.starsinbattledress.com. Secrets And Signals is released by House Of Stairs. You can visit their web site at: http://www.houseofstairs.co.uk. Contact via snail mail c/o House Of Stairs; PO Box 42307; London; N12 0XB; England.